Orthodontics is not just for children and teens. In fact, 1 in every 5 patients in orthodontic treatment is an adult. No one is too old for adult orthodontics. You bite on a vibrating mouth guard 20 minutes a day and you can shorten your treatment time by up to 50% and reduce the pain of having treatment. 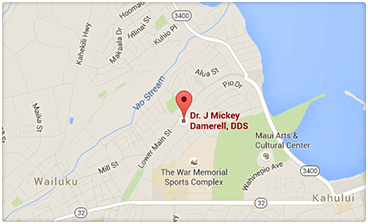 This is a Dr D exclusive on Maui and can be used with any of the following treatment options. Many adults are concerned with the appearance of braces. Often, Invisalign® (The invisible alternative to braces) can be used to treat adults. This technology involves clear removable aligners, fabricated through advanced 3D imaging to align the teeth. For more severe problems, we have the option of clear ceramic brackets instead of metal or invisible-inside braces: Harmony or Incognito. You cannot see these braces unless you open your mouth wide and look inside the mouth. Movie Stars, Dallas Cowboy Cheerleaders and discrete people choose these braces.